Photosensitive dermatitis. View of a photosensiti- vity reaction on the elbow. This is due to a reaction to the drug Oruvail (Ketoprofen) a non steroidal anti-inflammatory drug. Oruvail is used in the relief of pain & mild inflammation in rheumatic disease & gout. 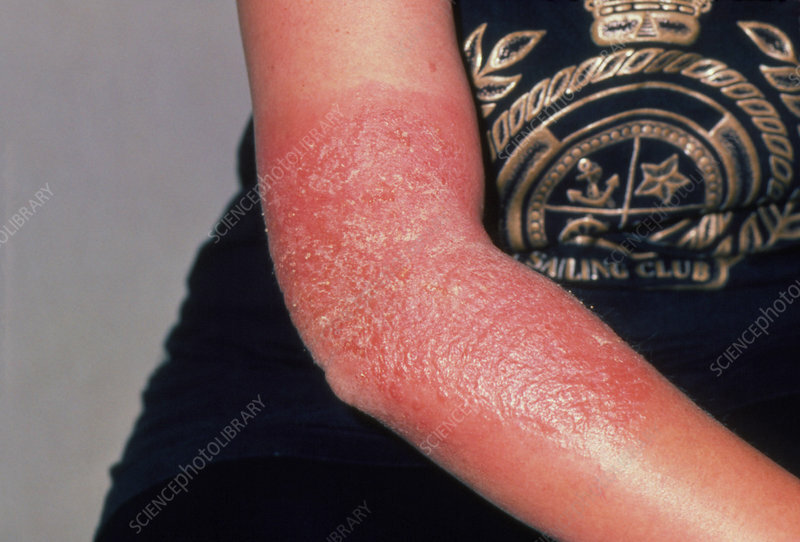 The skin over the elbow is inflamed, red & blistering. Photosensitivity is an abnormal reaction to sunlight and usually takes the form of a skin rash where the skin has been exposed to light. This reaction often occurs because a substance (or photosensitiser, such as chemicals used in perfumes or certain drugs) has been ingested or applied to the skin. Treatment includes avoidance of known photosensitisers.